Cut the sausages into the length you would like your corn dogs. Insert a toothpick or skewer into each and roll in the 3 tablespoons of flour to coat. Heat 3 inches of oil to 350F in a deep heavy pot. Whisk together the remaining ½ a cup of flour, cornmeal, baking powder, sugar, baking soda, cayenne and salt in a medium bowl. Whisk in one egg at a time, then the buttermilk. Pour some of the batter into a glass to dip your chicken dogs into. 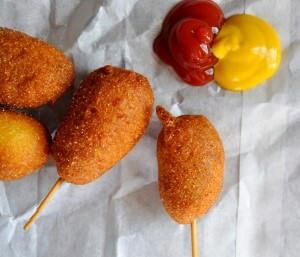 In batches of 2 or 3, dip in a chicken dog until coated, then fry for about 3 minutes or until the batter is cooked through and golden brown. Repeat until all your dogs are fried.